And now, for my favorite ponytail girl – Nakagawa Natsuki, the resident always-has-a-fantastic-ponytail girl from Hibike! Euphonium. On this penultimate day, here is Yasuri Shichika from Katanagatari! In the wise words of Kyon, “A ponytail increases a girl’s charm by 36%.” So here’s Suzumiya Haruhi. While we are approaching the end of this series of posts, here’s Senjougahara Hitagi from the Monogatari Series! Kumiko’s love interest in Hibike! 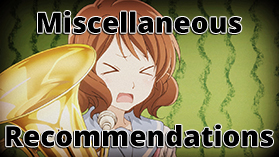 Euphonium – it’s Kousaka Reina! Today’s focus is one of the characters from Shirobako, Imai Midori!